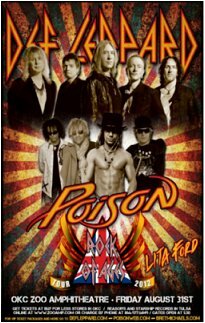 DCF Concerts have today announced a Def Leppard show with Poison/Lita Ford on the Rock Of Ages Tour 2012 in Oklahoma City, OK on 31st August. The venue is the OKC Zoo Amphitheatre which was last played by the band in September 2007 during the Downstage Thrust tour. Tickets for this show are due to go on sale at 10am on Friday 27th April.